Skoda Karoq Performance, Engine, Ride, Handling | What Car? The entry-level 1.0-litre petrol engine is surprisingly sprightly and has good low-down shove, so it's ideal if you spend most of your time in town. However, we would advise choosing one of the more powerful engines if you frequently cover big miles or carry heavy loads. The 1.6 TDI is more flexible and but will cost more in company car tax, while the 2.0 TDI offers the best blend of power and economy. With 148bhp and 251lb ft of torque, the 2.0-litre unit’s straight-line performance is more than adequate and whether you choose the slick DSG gearbox or sweet-shifting six-speed manual, the engine is kept suitably quiet at cruising speeds. In fact, if you’re planning on travelling five up with luggage on a regular basis, you’ll appreciate having plenty of firepower under the bonnet. However, we’re most smitten by the 1.5-litre turbocharged petrol. It has the same 148bhp as the diesel and proves well suited to the Karoq, delivering punchy performance in a refined manner. There’s plenty of power from low in the rev range, so you don’t have to work the engine hard and, regardless of driven wheels or gearbox, it’ll manage 0-62mph in around 9.0sec. That’s enough to whisk you and your family up to motorway speeds on all but the shortest of slip roads. Where 17in or 18in wheels are fitted, the Karoq comes up trumps for smoothing the harsh edges off ruts and bumps around town. Thus equipped, the Karoq upstages many rivals when smoothness is concerned, most noticeably the sportier and therefore firmer-riding Ateca and the less composed Peugeot 3008. Up your speed on the motorway and the Karoq's ride gets even better, making it an extremely gentle companion on a long trip. Models with 19in wheels are still comfortable for the most part, but you will feel more ruts and other road imperfections, especially at urban speeds. 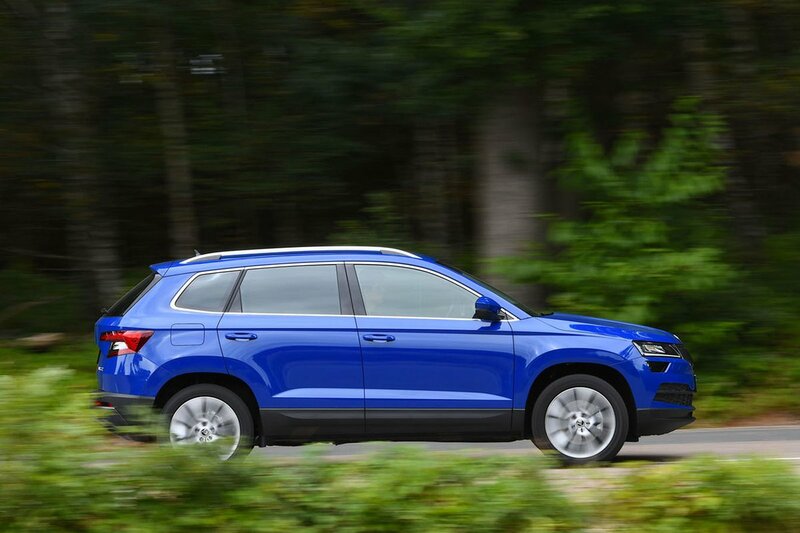 While the Karoq sits on the same platform as the Ateca and Volkswagen Tiguan, Skoda has clearly worked hard to give the Karoq its own character; it falls squarely in the middle of the spectrum between comfort and sportiness. Therefore, the Karoq exhibits more body roll in corners than the driver-focused Ateca, but it’s still more agile than the longer and heavier Tiguan. 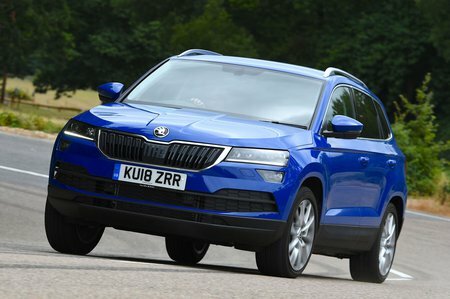 Like its relatives, the Karoq’s steering has a natural-feeling, progressive weight and a fine level of accuracy that lets you swoop from corner to corner with sublime ease. And with plenty of grip at your disposal, you won’t lack any confidence as you do. Yet, admirable as it is, there’s no doubting that those who prefer a little more on-the-limit cornering prowess will find the Ateca a noticeably sharper drive. Don’t forget that if you need your SUV to do more than just look the part, four-wheel drive is available. Mind you, while this might help you across a boggy field, don’t think of the Karoq as the tool to scale Snowdon – it isn't. Let’s start with the drivetrain – the engines and gearboxes. The diesels are a little grumbly under hard acceleration, while the 1.0-litre petrol thrums away (but not unpleasantly) if you give it some stick. On balance, we’d say the 1.5 petrol offers the smoothest progress of all, although even this screams a little at the top of its rev range. None of the Karoq's rivals are significantly better, though. 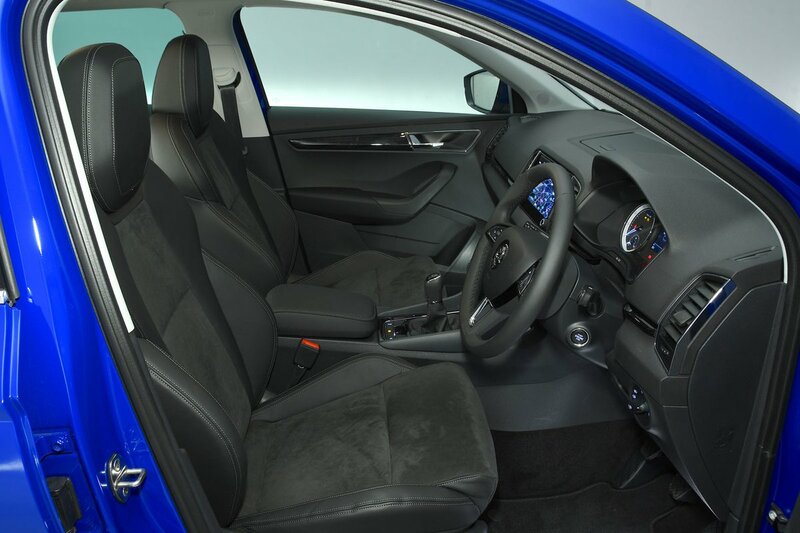 The manual gearbox is light and easy to use, as is the clutch. If you opt for one of the automatic models, these change smoothly between each gear but can be jerky from a standstill – a bit of nuisance when parking or in stop-start traffic. Despite being very similar mechanically, the Karoq does lose out to the Ateca when it comes to suspension noise, with a background boom as it deals with bumps in the road, as well as a little more tyre and wind noise as well. Mind you, none of this is anywhere near extreme enough to nark you.